Scotland haven't beaten Australia since 1882 and it is hard to imagine that run being ended. And before the accusations of negativity hit the inbox it is worth stressing that this hunch is derived more from an analysis of Australian strength than Scottish weakness. Australian cricket's proud roar may have been muted by England in three successive Ashes series, and they lose as many ODIs as they win nowadays, but there is a difference between a team that is forced to accept being second-best and one prepared to slum it in the second tier. The Aussies may have been humbled but they won't put up with being humiliated in Edinburgh. A 2005 loss to an inspired Bangladesh aside, Australian teams rarely allow minnows so much as a sniff of the warmer waters near the surface. And the players employed today won't lack motivation on the brink of another crack at England. James Faulkner said as much: "Any time you get the opportunity to play for your country, it doesn't matter whether you're playing England, India or Scotland, you've got to stamp your authority." In other words, brace yourselves boys because we are Australia and we are going to come hard. Besides, Scotland are not very well equipped to pick off a crack team coming at them hard. A prolonged reality check has engulfed the Caledonian game since Craig Wright's team were taken apart by Ricky Ponting's legends in Basseterre on a day in 2007 that had shimmered with false promise. 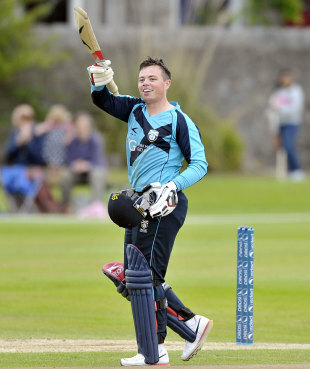 Beneath the surface, Scottish cricket is in reasonable health and the signs from the age group teams are promising, but the conversion process is a tough one and years keep passing without any natives making an impact in professional circles. Now that the Saltires are no more, Pete Steindl's crop of full-time players can no longer even impress their abilities on the counties in List A games. Nobody wants to see a mismatch on the scale of Australia's 189-run win here in 2009, nor England's visit in 2010, when the visitors only had to bat for 34 overs. So who is going to make a local stand? Majid Haq has got so many top-class batsmen out in the past 10 years that the accountant from Paisley has started to lose count of them himself. But will he have enough runs to bowl at? Kyle Coetzer is Scotland's captain and classiest batsman - unfortunately he is at home in the Midlands trying to cradle a new-born girl with a slow-healing wrist injury. His absence places greater pressure on Matt Machan, the Sussex allrounder who arrived as part of a new draft of Scotland players when the eligibility laws were tweaked. Great things are expected of him and still expected of Richie Berrington, who does everything the way an international cricketer should but perhaps still questions his inclusion in their company. Ireland have taught their Celtic cousins never to say never, but when they beat England at the World Cup they had 11 players who genuinely believed they were good enough to do it, naive as that sounded on the eve of the game. All logic indicates that Scotland will lose to Australia but not because they are especially weak, but more because the opposing force is strong. Andy Flower can assess Australia's Test side and identify cracks but Scotland's video analysts won't find too many weaknesses in the canary-coloured chainmail. Preston Mommsen, Coetzer's deputy, has a confidence based on a reasonably competitive performance against Pakistan earlier this summer, but this had a familiar ring to it: Pakistani teams seldom produce 100 solid overs in a day. Australian teams quite often do. Better days lie ahead for Scotland, a team resigned to the protracted nature of transition. This summer they have only beaten Kenya, who never travel well, in Aberdeen. One win from two World Cup qualifiers against Ireland in Belfast next week would be a presentable September return, leading into the World Twenty20 qualifiers. That said, there are many ways in which this exposure to elite opposition can be made to seem beneficial. Any signs of individual competitiveness and collective organisation would be warmly received.